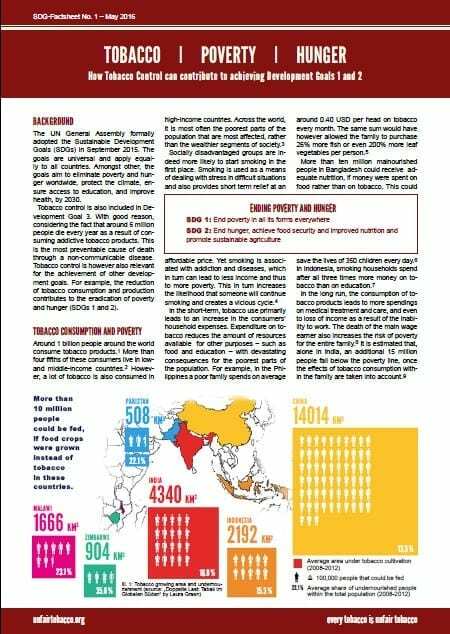 This two-page factsheet exemplifies how tobacco consumption and tobacco growing lead to an increase in poverty and hunger, particularly in the Global South. Furthermore, it specifies options for action in tobacco control in order to contribute to the achievement of Sustainable Development Goal 1 and 2 (End poverty and hunger). In six out of the top ten tobacco growing countries, a significant share of the population is undernourished.